Windy Knolls community is sold out and is not in active development by builder. If you are interested in Windy Knolls or similar new home communities, contact us today! Our agents are very familiar with new and newer construction in Newport News, and can identify resale opportunities in Windy Knolls, as well as builder inventory available in nearby or similar communities in Newport News. To view 12 more pictures, interactive maps and the full, detailed description of the Windy Knolls community, please Login. Don’t let the opportunity of owning a condo in Windy Knolls blow away. Builders aren’t making new home communities like this everyday in Hampton Roads. Five-star amenities and first-rate upgrades make this development outshine the competition. 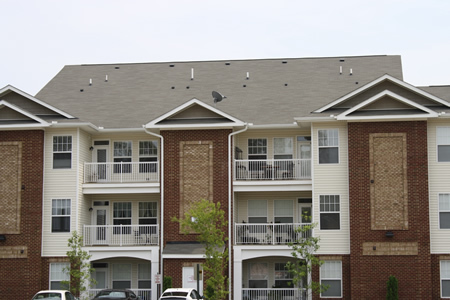 Located in Newport News, VA, this fine collection of condo units will impress first time buyers and seasoned pros alike. Military bases like Naval Weapons Station Yorktown and Joint Base Langley-Eustis are within minutes for service members needing to commute. This is one of those new home communities that will instantly stand out in a homebuyer’s mind. The builders took great pains to design comfortable, stylish housing. Windy Knolls offers nine units ranging in size from a little less than 1,140 to 2,250 square feet. Each condo here may feature hardwood flooring, fireplace with marble surround, Corian bathroom countertops, granite kitchen countertops, deluxe kitchen appliances in choice of white, black or stainless steel, balcony, private garage complete with door opener and remote and much more. Life in Windy Knolls is like permanently living on cloud nine. While some new home communities offer a few amenities, this development goes above and beyond. The builders want homeowners to stay refreshed, active and healthy, so they created this complex with those thoughts in mind. Work out whenever the mood strikes in the 24-hour fitness center. Party with neighbors and new friends in the clubhouse, grill out by the pool and get plenty of sun on the pool’s sun deck. The car care center can help when those wheels need some air and the 24-hour business center is a nice to have as well. Laid back Virginia living is at its finest in Newport News. A great thing about owning a condo is having the extra time to take in all the highlights of this region without having to worry about doing housework every weekend. Patrick Henry Mall is a nice place for shopping, entertainment and eating out. Take a spin on the Miss Hampton II Harbor Cruise to see this area from a different perspective. When looking at new home communities, be sure to notice how they compare. Builders at this development have shown how their new homes can outdazzle the rest. Don’t be swayed, come see how Windy Knolls trumps other new homes. Send me more information about communities similar to Windy Knolls. Our agents gladly offer FREE property tours of Windy Knolls, Newport News and homebuyer consultations to all serious buyers. Our Newport News SH Pro is prepared to represent you and your interests so you can move into your dream home.